Following the chilly days and frosty morning recently yesterday was substantially warmer. After I had my lunchtime sandwich the sun was shining so it was too good an opportunity to miss. I picked up the carp rod and a bag of crusts and set off for the lakes. There was no sign of carp activity at my first three usual stopping places so I trudged on to where I have seen lots of fish recently. I guess they must be thinking about spawning now and occasionally one will crash about in the reeds or jump out of the water. Often there are small groups swimming round together. Anyway, I cast my big crust to the edge of a reed bed so that the line lay across a broken reed stem. To my surprise, within minutes a decent fish came up and nuzzled the crust. It sucked it half into its mouth before rejecting it and swimming slowly away. This was looking promising. I'm thinking that at least the carp know there's a piece of crust out there, so I waited - and waited - and waited. My bait lay untouched. Occasionally it jiggled a bit in the breeze but none of the many carp basking within a metre or two of its position showed any further interest. After three-quarters-of-an-hour I lost patience and reeled in to try another spot. 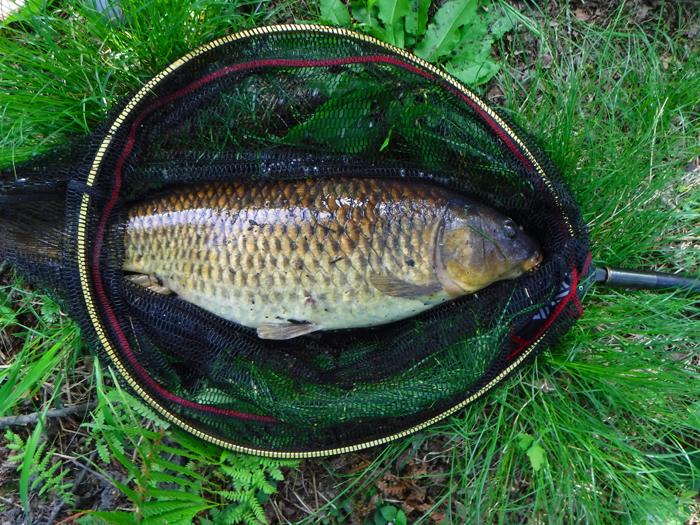 I walked round the end of the lake to the opposite side of the reed bed, there were still plenty of carp showing. I cast again to a gap in the reeds and this time there wasn't even any sign of fishy interest. Eventually I had to reel in again when, despite my arm waving and hissing, a goose decided to eat my bait. Bugger! The carp didn't seem to mind the presence of the goose but if it got too close they generally sauntered off out of its way. What should I do? I decided that the only way to avoid a goose attack on my crust was to dangle it under the rod point close to where I stood. I did this and poked the rod out through a fork in a tree trunk which as well as being an impromptu rod rest concealed me from the carp. I turned the handle of the reel so that there was no slack line on the water surface. In the space of ten minutes several fish swam past the floating bread. "They MUST be able to see my bait," I thought and once or twice I held my breath as individuals swam straight towards it but passed under without stopping. I was glancing at my watch and thinking that it was about time to go and have my tea when one of the larger carp swam to the bait, tilted up, sucked it in, hooked itself and set off for the far end of the lake. 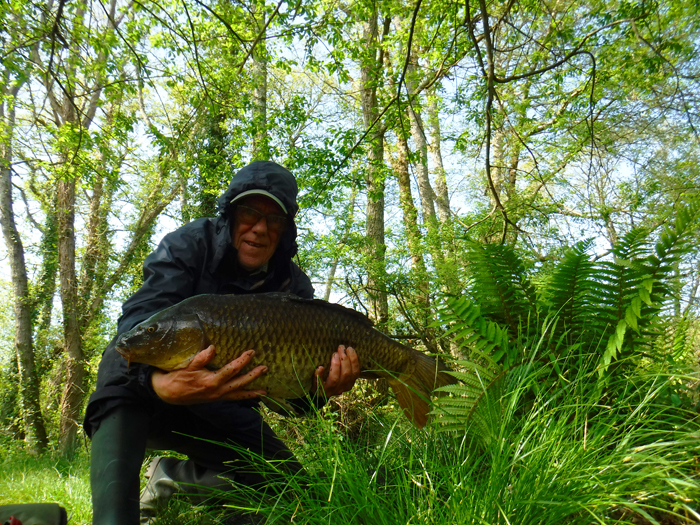 I was hanging on to the rod as the carp took line but now I had to pass the rod round one of the alder tree trunks so that I could play and land the fish. I accomplished the manoeuvre with only minor grazes from the tree bark and a strained shoulder. Now it was just a matter of playing it into the net. It was a cracking, fully-scaled fish substantially bigger than the 19 pounder I had recently but I forgot to weigh it in the excitement of taking a picture and putting it back. Then I went home for my tea. Not weighed but bigger (and better looking) than the 19 pounder I had recently.